Last week, just as the weather was getting warmer, a new green cart debuted in Bedford Park on the corner of Grand Concourse and Bedford Park Blvd. It seems to be the first green cart in the neighborhood, though we'd like to hear more about this from our readers. The cart offers summer favorites like pineapple, cherries, and watermelon. If you live in the area, be sure to check it out. this is awesome..I live in the neighborhood and walked by this two weeks ago. Great stuff! 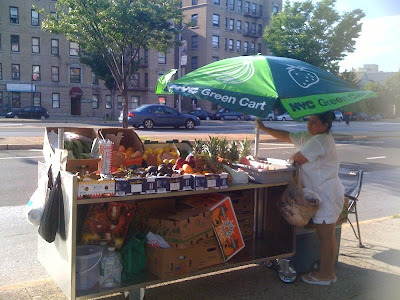 I've purchased Strawberries and Bananas from this cart on two separate occasions. The man and woman duo running it seem very enthusiastic about running it and one day they I found them running specials at lunchtime on a quartered watermelon! They said they have daily hours of about 8 am to 7 pm but this week I have not seen them out until after 9 am. Being a local resident I welcome the presence of the Green Cart! This is so smart of them as it is a great location. I'm sure many of us have stopped by one of these in manhattan and hopefully we'll support this one in our own neighborhood.